Opportunities in the STEM fields (science, technology, engineering and mathematics) are increasing steadily. In the US, there will be more than 9 million jobs by 2022, according to the US Bureau of Labor Statistics. However, there is also evidence that there will not be enough employees to fill these jobs. A 2012 report by the US Congress Joint Economic Committee stated that "despite the clear demand for STEM talent by domestic employers, the US is failing to produce an ample supply of workers to meet the growing needs of both STEM and non-STEM employers." Meanwhile, African Americans compose just 6 percent of the STEM workforce, according to a 2013 report by the US Census Bureau. 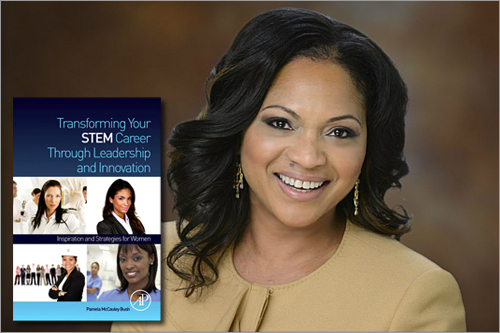 Various historically black colleges and universities (HBCUs) around the country are producing STEM degree graduates and contributing to the workforce demand for diverse STEM talent. One of them is Harris-Stowe State University (HSSU) in midtown St. Louis. HSSU is a fully accredited four-year institution that offers 14 degree programs in the areas of teacher education, business and arts & sciences. Over the past five years, the university broadened its niche to increase the number of underrepresented graduates in STEM by adding biology and mathematics degree programs approved by the Missouri Department of Higher Education. To recruit more students, the university formed partnerships with local institutions. HSSU and Saint Louis University (SLU) signed an agreement to offer students a dual degree in mathematics and engineering. Also, HSSU has a collaborative articulation agreement with the Goldfarb School of Nursing at Barnes Jewish College. Our transition was made possible largely by a grant from the National Science Foundation. 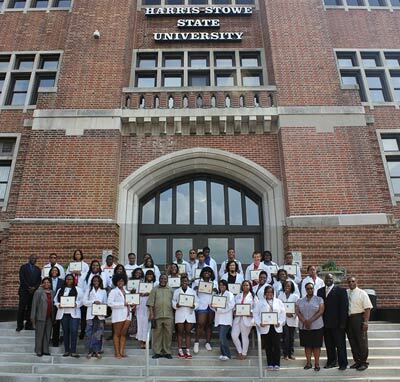 In August 2008, HSSU was awarded a $2.5 million NSF Historically Black Colleges and Universities Undergraduate Program (HBCU-UP) Implementation Grant for increasing STEM retention. This was the largest grant in the history of the institution. Through the support of the HBCU-UP grant, various STEM initiatives such as the undergraduate research program, student presentations at national conferences, STEM faculty and student mentoring sessions, and the Science and Mathematics Academy program have transformed the campus. Also, full-time STEM faculty serve as mentors to transfer and non-transfer students majoring in biology, mathematics, dual degree mathematics/engineering or teacher education with an emphasis in mathematics or science. "Many of the students in the College of Arts & Sciences are making history, and we are delighted and proud of their accomplishments," said Dr. Lateef Adelani, Dean of the College of Arts & Sciences. He pointed out that five of our 2012-13 alumni in STEM are now in graduate schools pursuing advance degrees in the areas of mathematics/statistics, finance, food science and biology. Between spring 2009 and spring 2014, 67 STEM majors have participated in undergraduate research activities. During this period, participants have conducted research in mathematics, biology, mathematics education and science education under the supervision of mathematics and science faculty at Harris-Stowe as well as other scientists at sites of collaborating institutions such as the World Aquarium in St. Louis, Washington University in St. Louis, SLU, the Missouri Botanical Garden and the Donald Danforth Plant Science Center. Another program that was created with this grant is our Academy for Science & Mathematics, a residential five-week college preparatory program held each summer. It is designed for incoming freshmen who have been admitted to HSSU and are beginning their college career in the fall semester. Students majoring in biology, mathematics, dual degree mathematics/engineering, or teacher education with an emphasis in mathematics or science are invited to apply. Be prepared for classes, read ahead of schedule, and study your notes on a regular basis. 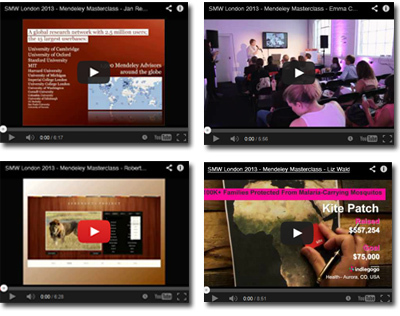 Regularly attend classes and review the course syllabus. Maintain an organized notebook, including all related course materials. Meet with the professors during scheduled office hours and ask specific questions for clarification. Take advantage of undergraduate research opportunities. Participate in related extracurricular activities, such as an on-campus science or mathematics club. Time management is critical; balance the time between school, work and personal life. The academy introduces the selected participants to rigorous college-level STEM courses, such as chemistry, biology, mathematics, physical science, and computer education. Students participate in tutoring sessions and student-led group research projects; receive mentoring from HSSU faculty, and experience weekly field opportunities, including visiting local nature reserves, engineering firms and R&D facilities. Throughout the program, local and national STEM professionals give presentations on STEM careers and academic success. This STEM bridge program gives students a sense of community, camaraderie and self-identification as STEM majors. Borrowing from the tradition of the White Coat Ceremony established in 1993 by The Arnold P. Gold Foundation at Columbia University's College of Physicians and Surgeons, each participant begins the summer enrichment program by receiving their Science and Mathematics Academy laboratory jacket. At the cumulating Science Expo, the students and STEM faculty highlight their research projects to the HSSU academic community, family and friends. Going into the academy, I did expect to be mentally challenged. However, I quickly learned that being a college student was no joke. The Math and Science Academy taught me how to be an independent worker, and to think outside the box. One thing I greatly appreciated about the academy was the hands on and academic help that was offered throughout the entire program. Overall the academy gave me a great sneak peak of what college life would consist of; not to mention the long nights and early mornings. The Math and Science Academy was an honorable experience, and I would recommend the program to any upcoming freshmen. Through the support of the HBCU-UP grant, several HSSU students travel to national conferences and disseminate their research results to colleagues. The university has received honors twice at the Emerging Researchers National (ERN) Conference in STEM, sponsored by NSF and AAAS. HSSU student David Marango and Dr. Ann Podleski, Professor of Mathematics, received second place honors in the Mathematics and Statistics category for their research project titled "Mathematical Modeling of Genetic Counseling with Application to Sickle Cell Anemia" at the 2012 ERN Conference. 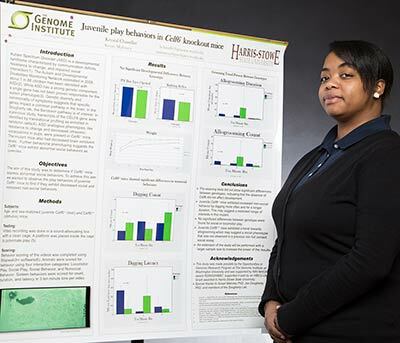 At the 2014 ERN Conference, HSSU student Krystal Chandler placed first in the Genetics subcategory for her collaborative research entitled, "Juvenile Play Behaviors in Celf6 Knockout Mice." Chandler previously completed her summer internship research at The Genome Institute at Washington University (GI-WU) under the advisement of Dr. Susan E. Maloney in the Department of Genetics and Psychiatry and Dr. Joseph D. Dougherty in the Department of Genetics. The study was made possible by a National Institute of Health grant awarded to GI-WU and in part by the HBCU-UP grant awarded to HSSU. STEM discoveries are rapidly changing and it is an exciting time for innovation. HSSU students who participate in undergraduate research receive not only technical skills but also critical thinking skills preparing them for future opportunities. Dr. Tommie Yvette Turner is the Director of the Institute for Science and Mathematics at Harris-Stowe State University (HSSU) in St. Louis. 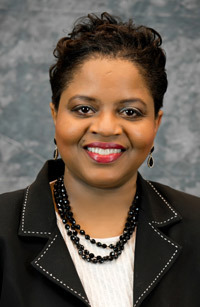 She leads the Science and Mathematics Summer Academy for first-year HSSU students, oversees the science and mathematics tutorial program, assists with the faculty mentoring program, develops strategies to assist in the retention and matriculation of students in STEM program areas, and serves as a liaison between university units and the external STEM community. Dr. Turner earned a PhD in pharmaceutical science/environmental toxicology from the College of Pharmacy and Pharmaceutical Sciences at Florida A&M University. She is a NSF/OURS Fellow (National Science Foundation Opportunities for Under-Represented Scholars program), and a member of the American Association for the Advance of Science (AAAS) and the Association of Women in Science (AWIS).